Samantha Hemsworth is the wife of one of the three Hemsworth brothers, Luke Hemsworth. The couple tied the knot sometime in 2007 and has four girls together. Samantha and Luke have gone ahead to grace lots of events together and of course, they take a lot of joy in sharing their love life to fans through their social media pages. Here is more about her life and her husband. Among the many celebrities in the world, Samantha Hemsworth is one lady who celebrates her birthday year into the year with a bash and in attendance are well-renowned celebrities including the likes of Miley Cyrus, Wayne Cole and lots others. She was born on the 14th of August 1980. Samantha is an Australian who has kept the details of her family and parents away from the public eye. There are also no available records of her education. No one really knows what Samantha has been up to career wise but it was not up until her union with one of the three Hemsworth brothers that she became a person of interest. For the now, Samantha is simply known to be a supportive wife and a caring mother. 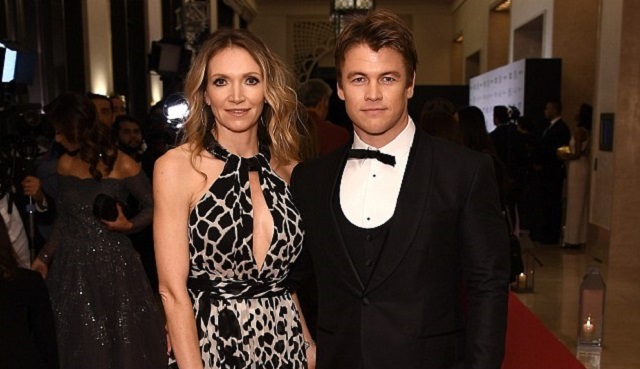 Samantha fell in love and married Luke Hemsworth sometime in December 2007. There are no particular details on how they both met, however, their union has lived on for over ten years and counting. The duo is no private couple as they have taken to several social media platforms to express their love for each other and of course, walk arm in arm to every public and red carpet event. Two years after the love birds tied the knot, they welcomed their first child and named her Holly. Then a year later, their second daughter, Ella followed. Harper Rose their third child who joined the family in the year 2012 is just a year older than their last child, Alexandre. Luke Hemsworth is quite successful with his career as an actor. He rose to fame with his extraordinary performances in the television series, Westworld. He is also notable for his role in Last Man Standing. The actor was born in the same year with his wife, but he came later in the year precisely on the 5th day in the month of November. His mother was an English tutor while his dad, Craig Hemsworth was a reputable social service counselor. He and his brothers, movie stars; Chris Hemsworth and Liam Hemsworth are often referred to the Hemsworth brothers. They all grew up in Melbourne and are quite successful with their various acting careers. Luke is an Australian who holds a mixed ethnic background including Dutch, English, Scottish, German, and Irish. Ever since the inception of his career, Luke has been an incredible performer, excelling in most of his roles and proving just how much of an incredible performer he is. Some of his notable works include; Tangle, The Anomaly, The Elephant Princess, The Reckoning, Bikie Wars: Brothers in Arms, Caria Carnetti PD, Satisfaction, Westworld and Kill Me Three Times. Samantha Hemsworth is quite an attractive lady and is no wonder why of one the hunky Hemsworth brothers chose her to be his wife. Her height adequately complements her husband’s who stands at about 6 feet tall, as a matter of fact, – exactly 5 feet 9.5 inches tall. Photos of them together clearly show that Samantha stands almost the same height as her husband, with the help of a few inches long heels. Her height is said to be 5 feet 6 inches. She has blonde hair and a pair of beautiful grey eyes. When it comes to Samantha’s money bag, this is quite difficult to ascertain as she is yet to reveal any details pertaining to her career. She hides under her husband’s shadows and is taking her time with her family. Her husband’s net worth is pegged at $3 million. See Also: Ray Liotta – Bio, Wife, Daughter, Age, Net Worth, Girlfriend, Is He Gay? As aforementioned, the lady is an avid social media user. She uses most of her platforms to blog about her family and her love for her husband. As a fan of hers, you could get every information you need to know about her family on her social media handles; Instagram @thesamanthahemsworth, facebook – Samantha Hemsworth and twitter – hemsworthsa.